The very fact that he disappeared from TWITTER and Facebook is no doubt due to pressure from SECURITY/Mossad/Shabbak and their many helpers known as Sayanim, who monitor this reporter. (CLERMONT, FLA) - On May 2, 2012, Israeli press reported that the Military Censor announced that the Israeli Defense Forces have launched a new system to monitor information on Facebook, Twitter, blogs and news sites. Today they sent first notice, they will renew the restrictions.sent to my Lawyer. Now you are free,we can close the Cause.either you do it or I will do it. I am going to deactivate my Facebook,very soon. A few hours later, Vanunu Mordechai’s image at Free Mordechai Vanunu had become a ghost. A few days later I resumed my previous position as lone administrator, but that is another long story and as this is an ongoing series I punt it forward. "I found Vanunu very straightforward about his motives for violating Israel's secrecy laws he explained to me that he believed that both the Israeli and the world public had the right to know about the information he passed on. He seemed to me to be acting ideologically. 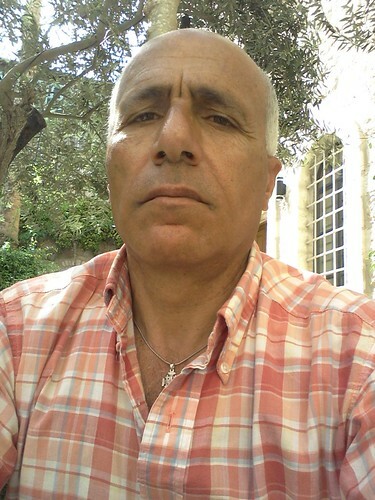 Now, as Vanunu had sent out less than thirty TWEETS to less than thirty followers, the very fact that he disappeared from TWITTER and Facebook is no doubt due to pressure from SECURITY/Mossad/Shabbak and their many helpers known as Sayanim, who monitor this reporter. I invite all to read me, but WHY can’t we talk? After all, I have sent YOU via Vanunu’s gmail and yahoo accounts many alerts to my articles about Vanunu with the Subject: SECURITY ALERT! “Write about what disturbs you, particularly if it bothers no one else” is a line in “The HELP” by Kathryn Stockett. And after a serendipitous meeting with Vanunu on the first day of summer in 2005, which was five days before I departed back to USA from my first of seven trips to Israel Palestine, we began a series of interviews focused on his childhood in an Orthodox Jewish home in Marrakech. I was most interested in his crisis of faith and culture which began when his family resettled in Beersheba in 1963. Vanunu was nine while America was grieving the incomprehensible loss of President Kennedy and I am nine months older than Vanunu. My initial interest was and remains in Vanunu's welfare which requires his freedom from 24/7 surveillance and the right to fade into the world. As a sister/friend, I pray for his endurance in what I see as his crucifixion of twenty-six years because he told The TRUTH about Israel’s nukes and became a Christian-the 'unpardonable sin' for particular Jews. 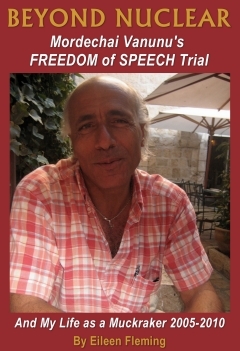 On April 30, 2007, the Jerusalem Magistrate's Court, convicted Vanunu on 14 [out of 21] counts of violating a court order prohibiting him from speaking to foreign journalists. Vanunu was also convicted for traveling from Jerusalem to Bethlehem when he hoped to attend Christmas Eve mass at the Church of the Nativity, his first Christmas after being released from 18 years in jail. On July 2, 2007, Israel sentenced Vanunu to six months in jail for speaking to foreign media in 2004. Two days before President Bush's first trip to Israel and a day before Vanunu's appeal was to begin, Israel sentenced him to community service instead. In November 2009, Vanunu suffered another crisis of faith and “fired God” from his case.
" And if I know all mysteries and all knowledge, and speak in the tongues of men and angels, BUT HAVE NO FREEDOM, I am NOTHING. And if I have all faith so as to remove mountains, but have not FREEDOM, I am NOTHING." 1 FREEDOM 13:1-13 If I speak in the tongues of men and angels, but have not FREEDOM, I have become sounding brass or a tinkling symbol. And if I have prophecy and know all mysteries and all knowledge, and if I have all faith so as to remove mountains, but have not FREEDOM, I am nothing. On May 23, 2010, Israel sent Vanunu back to solitary confinement in a maximum prison facility and released him on August 8, 2010. Vanunu emerged on fire and immediately became active on Facebook. Within a short time had nearly 1,000 Facebook Friends, but soon whittled them down to 46. I was one of the many he “fired” and how we began conversing again is another long story that I will punt forward. "This is the secret that hasn't yet been told in the affair: the story of the security fiasco that made it possible for Vanunu to do what he did, and the story of the subsequent attempts at cover-up, whitewashing and protection of senior figures in the defense establishment, who were bent on divesting themselves of responsibility for the failure. The 18-year prison term to which Vanunu was sentenced is almost exactly the same period as that in which Yehiel Horev has served as chief of internal security in the defense establishment [who has been] involved in the affair as deputy chief of security at the Defense Ministry, and also after Vanunu's abduction and arrest, as a member of an investigative commission. Vanunu turns 58 this October 13th. The last time I saw him in 2009, he told me that he endures his open-air captivity by escaping into opera. “Every morning I am in my room until eleven listening to opera. I find ways to enjoy myself as my way of resistance. I transform anger into positive energy." Vanunu is a fan of Wagner, but this little sister recommends Beethoven’s only opera in which he expressed his dream for humanity-a liberation into true sister-brotherhood. UPDATE: The PR FIRM REFUSED to run my NEWS-PRESS RELEASE with a lame excuse -their Legal team required the "court case number" but I had NO problem locating another news-press release distribution org and so, the update to this story will now go online in a few hours. Much GRATITUDE and LOVE for all your patience and support! PS: As of this writing the FaceBook Cause to FREE VANUNU is 5,719 strong- and was 5,536 when article posted. Come Wednesday I am publishing PR NEWS-PRESS RELEASE on this ongoing story. AND Please check VANUNU WIKI page under "Arrests and hearings"
But links to my articles @ WIKI have 'disappeared' before. In Solidarity YES WE CAN HELP FREE VANUNU!! !